As the cold weather descends and as I set the thermostats a little lower to cut back our electricity use (I’m studying our use to figure out where we use too much electricity) I decided it was time to isolate the entry. On sunny days we are toasty but cloud cover means the house doesn’t warm up as much during the day. When I feel cold I just want to snuggle up in bed and read a book and I have projects that need to get done! 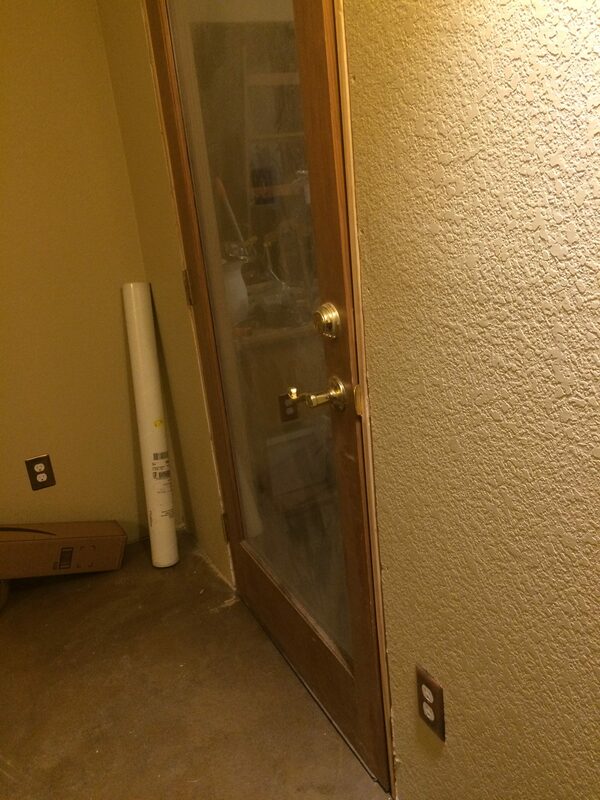 So I’m hoping the airlock keeps the house warmer by shutting off the doors we use to the outside and the garage. 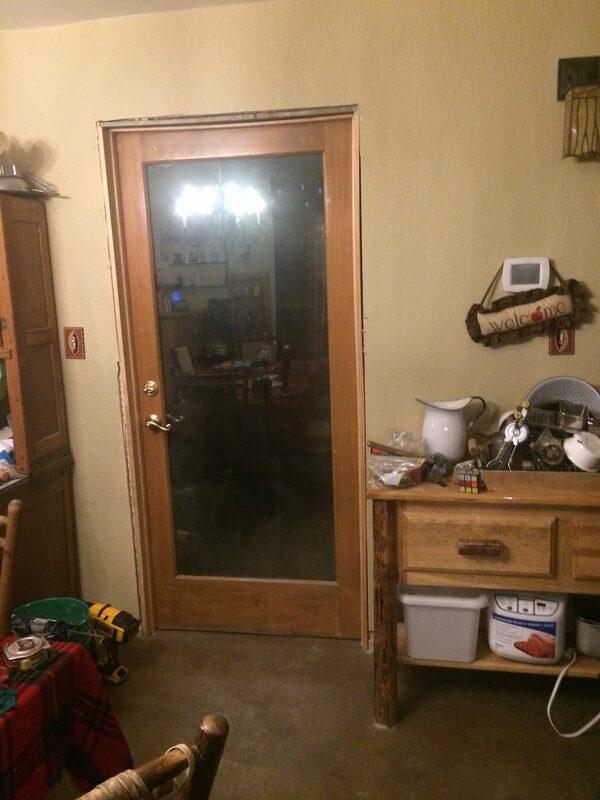 The entry door was another Craigslist find and it appears the door is slightly warped. Or it could be that our wall is slightly out of plumb. I put together the door jamb from pine door framing lumber. I had not purchased an extra piece for the header so I used an old piece of pallet lumber that happened to be 4 1/2″ wide. 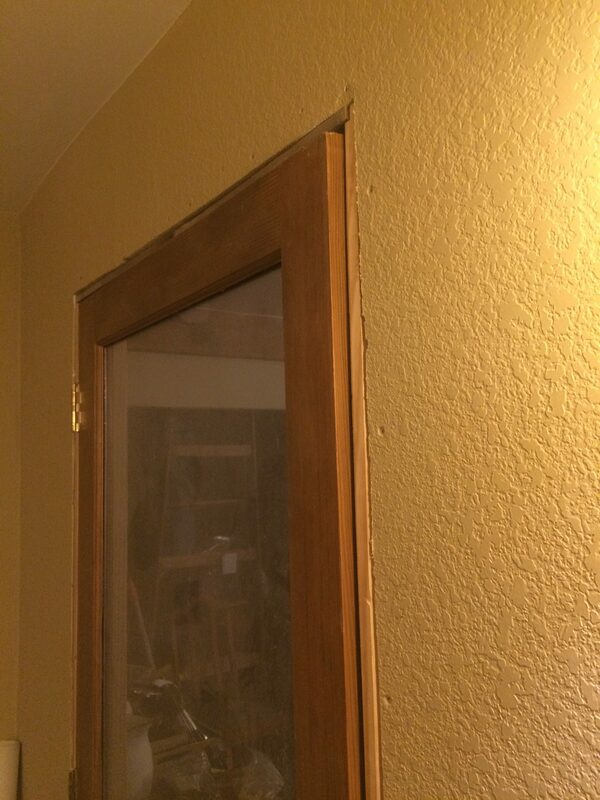 I leveled the door frame in the rough opening on both sides and across the top. But the edges don’t seem to match up perfectly. 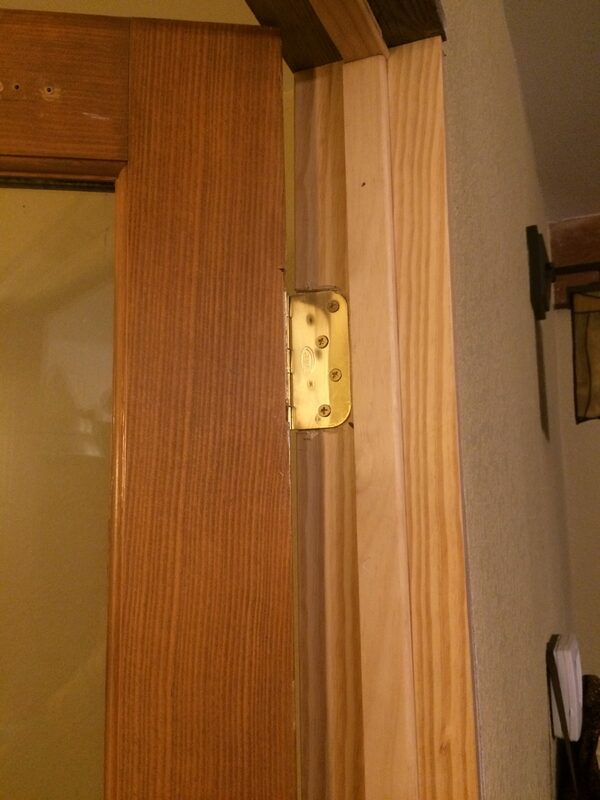 The bottom of the door and the hinge side both line up fine. So my guess is that the whole wall is a bit out of plumb. The stops were taken out and moved to align with the door on the inside. I hope the trim just hides this reveal on the airlock side. Thicker log trim would help hide this. The hingers were unfortunately on the wrong side of the door, so I had to cut the hinge mortises across and hang the hinges on the opposite side of the door. I used the multitool to cut the notches and slice off the narrow piece of wood to set the hinges. Not the neatest job but I don’t have a router setup to do this more cleanly. The door was up on a spacer when I figured where the hinges would be set but I didn’t account for any variation in the floor height. Unfortunately the floor swells a bit in the door pass so the weather stripping on the bottom scrapes against the floor. I suppose I will have to remove it. I didn’t have room to hang the door higher or it would have to be trimmed at the top. So for now it opens and closes just needs to be pushed over the higher area of the floor. I really like the full glass and the heft of the wooden door. I just have to get it cleaned up and put away some tools. This entry was posted in Air Intrusion/Thermal Envelope, Construction. Bookmark the permalink.